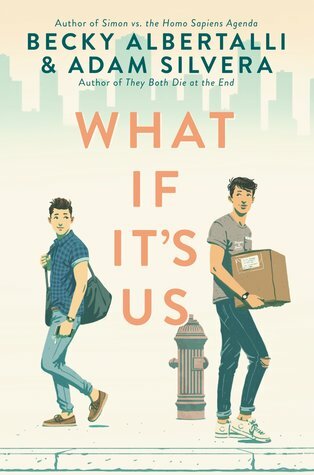 Today my sister Samantha has dropped by to review What If It's Us by: Becky Albertalli & Adam Silvera. "Arthur is only in New York for the summer, but if Broadway has taught him anything, it’s that the universe can deliver a showstopping romance when you least expect it. But what if it is?" Hey! Teresa has yet again come in clutch by letting me read an Adam Silvera book early. And Adam has once again written a bittersweet masterpiece with What if it’s Us. However, thanks to Becky Albertalli, this one was way sweeter than bitter. So thanks to everyone involved to make this review possible. I have to admit, I was a little hesitant about this book. Partly because I wasn’t sure what to expect with such different writing styles coming together and partly because I just wasn’t happy with The Upside of Unrequited, and I haven’t quite mastered the art of accepting that I’m not gonna love every book an author comes out with. Thankfully, I absolutely adored this book. Their writing styles came together perfectly and there’s not a single bad thing I have to say about it. Alright this is the part where I actually talk about the book, right? Right, so let’s go. Firstly, I’m gonna try not to spoil it, but all I have to say is in my heart of hearts they get their happy ending and Dylan (who’s getting his very own paragraph as my favorite character) at least gets a FOUR way wedding he dreams of in his future. That being said, the ending was a perfect clash of Adam’s realism and Becky’s perfect story endings. Arthur and Ben don’t have to be together to stay best friends, and they both got the do overs they desperately needed with the important people in their lives. It was an amazing ending whether Dylan gets to live his dream or not. Another thing that I loved about the book, is the acknowledgement that relationships are never perfect. No matter how happy a relationship is, there are going to be ups and downs, but that doesn’t mean they love each other any less. Characterizing Arthur’s parents the way the authors did was perfect to show this and I think it can help readers of all ages feel more secure in their own relationships and the relationships around them being exposed to this in literature instead of the usual black and white of toxic or completely perfect. Speaking of characterization, the characters in this book are amazing. Every single one of them. Arthur is so precious, with his broadway fanboying and disliking of arcade games. He and I would be best friends if he were real. He’s always goes the extra mile for the people he loves and that’s admirable. If we all showed others how much we cared as much as Arthur did, society would be much better off. He’s a Neville Longbottom in a world of Draco Malfoys (or put simply, a perfect angel in a world of absolute douchebags) and we don’t deserve him. I also firmly believe I’d be best friends with Ben. We both love Harry Potter and we both hate chemistry. What else is needed to form a bond? Also our mutual competitiveness would make for epic Mario Kart faceoffs, just saying. Ben may have a harder time displaying his emotions, but that doesn’t mean he doesn’t have said feelings. I believe it was important to show that different people show affection differently, it sets readers up to be more understanding and realistic in real life relationships, but I’m digressing aren’t I? Anyway, even “smaller” characters are amazing and loveable. Even Hudson ended up likeable, which was refreshing from the usual evil ex boyfriend in YA novels. Now comes my favorite part of the review, where I gush about my favorite character!!! For What if it's Us? That honor goes to Dylan. Dylan vaguely reminds me of Jake Peralta from Brooklyn 99, whom I also love with all my heart. They’re both goofballs who are sarcastic, extremely caring towards their friends, and just a teeny bit cocky. Dylan is absolutely hilarious and any scene he was in was a highlight for me. I’d read a 200 page book of him being snarky at anyone and everyone. It doesn’t even need a real plot to it. I’d still love it. His best trait? His humor. Even in the hospital he was still an absolute firecracker making jokes about how he flipped off death and now he’s immortal. If he were real, I think we would also be best friends (even though he doesn’t believe in multiple best friends. I’d make him believe). We have a similar sense of humor and he’d probably yell at me all the time for my hatred of coffee, but clearly that wouldn’t be a deal breaker since Ben is always ordering lemonade at coffee shops as well. Anyway it’s now 4 am and I’m finished saying what I need to say, so take away points of this review: 1) Dylan, Arthur, Ben and I would make a super sorcerer squad of two hufflepuffs (me and Arthur for our loyalty, patience, and honesty), a Gryffindor (Dylan, mainly because when Ben is afraid, he wishes Dylan were there. Which means he’s brave, and he definitely has nerve to be calling Samantha his future wife so soon in their relationship) and a ravenclaw (I don’t care what Ben thinks about his intelligence, he’s witty, creative, one of a kind, and values accepting and being accepted by others, a true Ravenclaw if I ever saw one). 2) I would 100% recommend this to people. It’s an amazing story with amazing characters written by amazing people. The trifecta of what makes an amazing book. 11/10 would recommend. I’d like to once again thank Teresa for letting me read this book and Adam and Becky for writing it at all. I look forward to any possible future collaborations from these two as well as books they individually write. Thanks for reading this giant ramble, hopefully you got something out of it and I convinced you to read it.